The Lesotho experience is unique. Soaring mountains beckon, skies overwhelm, waters run wild and deep. Under thick snow or scorching sun, Lesotho is a beautiful and challenging environment. Experience a country which must have given birth to the very spirit of adventure and excitement. 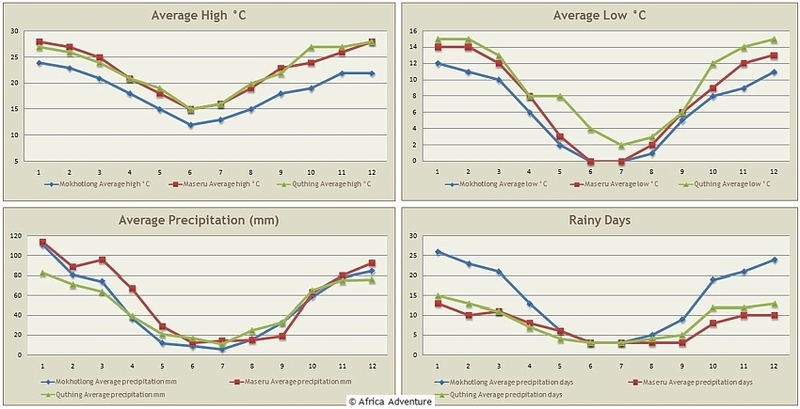 Heights, depths, sizes, distances, temperatures - they are all extreme in Lesotho, where man and beast have successfully and harmoniously coexisted since prehistoric times and have had to meet the extraordinary challenges of the natural world here, to ensure survival in this unique country. 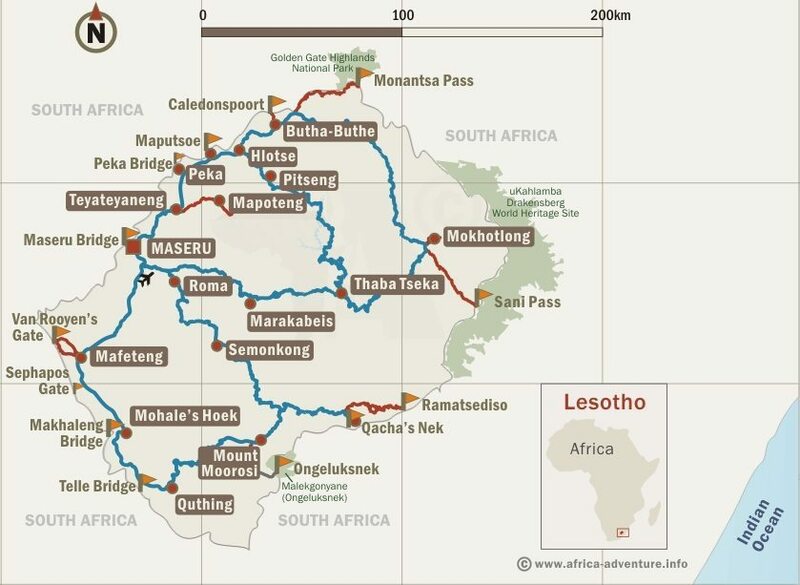 The nature loving visitor or eco-tourist is not only welcomed in Lesotho, but spoilt for choice in this country of 30300 km2 of unfenced and unspoilt beauty. The remote and lovely environment offers the ultimate action holiday with a staggering array of pursuits. Challenges abound in this land, including: the Guiness World record highest commercial abseil of 204 m along side the Maletsunyane waterfall; exhilarating whitewater courses; canoeing; spectacular snow skiing in winter; horse riding; pony trekking; mountain climbing; hiking and; off-road racing. Whether exploring the mysteries of the past, wonders of the present or your own frontiers of adventure, Lesotho welcomes you. Lesotho boasts pristine dinosaur relics and is a Mecca for archaeologists and paleontologists alike. The country even has a dinosaur named after it the 1-metre long herbivorous lizard, Lesothosaurus, a very primitive ornithopod from the late Triassic and early Jurassic Period, 208 to 200 million years ago, which has been reconstructed into a model, on view in the Natural History Museum in London. Dinosaur footprints can be spotted in various areas around the country and at a preserved site in Quthing district. Lesotho's remote and rugged countryside is spectacular in all its guises and gives the visitor that primal thrill of discovering the unknown. The serenity of the landscapes and skyscapes also lures holiday makers who enjoy more gentle pursuits. There is, of course, wonderful fishing in the mountain streams, the terrain positively begs to be walked or hiked or ridden, no matter what the weather, and breathtaking landscapes in different combinations of mountains, skies and water challenge artists and photographers alike. The thin and cool air in Lesotho at altitudes of 3 000 metres, which is deservedly classed as the highest country in the world, imparts a gentle hue to the colours of nature and is the reason why Lesotho's mountains famously have an almost transparent blue tone and an ethereal feel. Sites of staggering natural splendour await the curious visitor in some remote locations. Reaching those spots is a challenge in itself for many, and nowhere else are off-road sports more fun, grueling, exhilarating and positively addictive than in Lesotho; on top of the world. Neither is it surpris¬ing that this is the home of the annual world-famous Roof of Africa Rally. The Basotho people are warm and hospitable and as a rule are happy to share glimpses of their traditional life with the visitor who, as a courtesy, should first approach a village headman or chief before engaging villagers. The pristine condition in which most Basotho keep the insides of their huts is legend. And the inside of these traditional homes are also fascinating in that they are decorated with exquisite objects. Many household implements or domestic necessities are the product of fine craftsmanship which has been acquired through the generations.